This week my friends and I in our #SundaySupper group are having a virtual chili cook-off! Since I have been in several chili cook-offs before and have one winning chili recipe, Chipotle Beef Chili, I was excited to try my hand at a new chili recipe and hope for a win in our virtual cook-off. 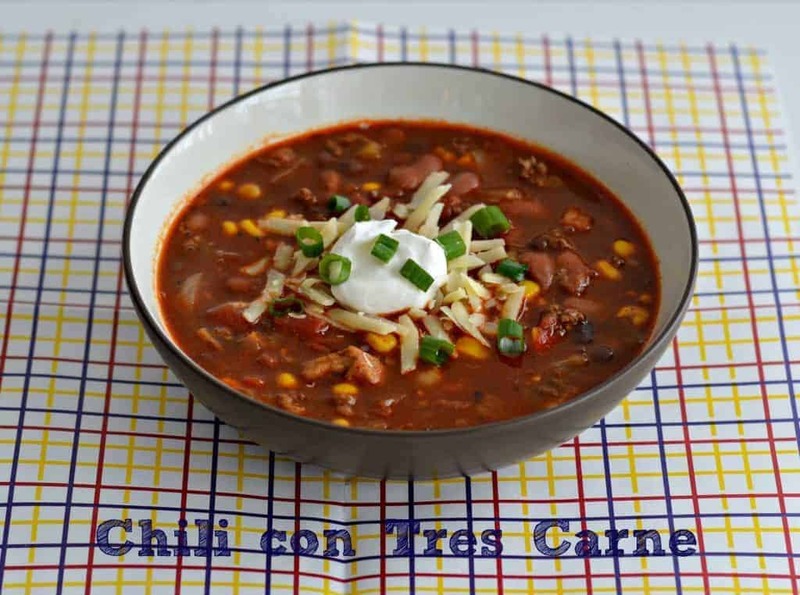 After checking out probably close to a hundred chili recipes online as well as looking through my own chili recipes, I combined a ton of different elements from different recipes into one totally MAG recipe for Chili con Tres Carne. Tres carne in Spanish is three meats. 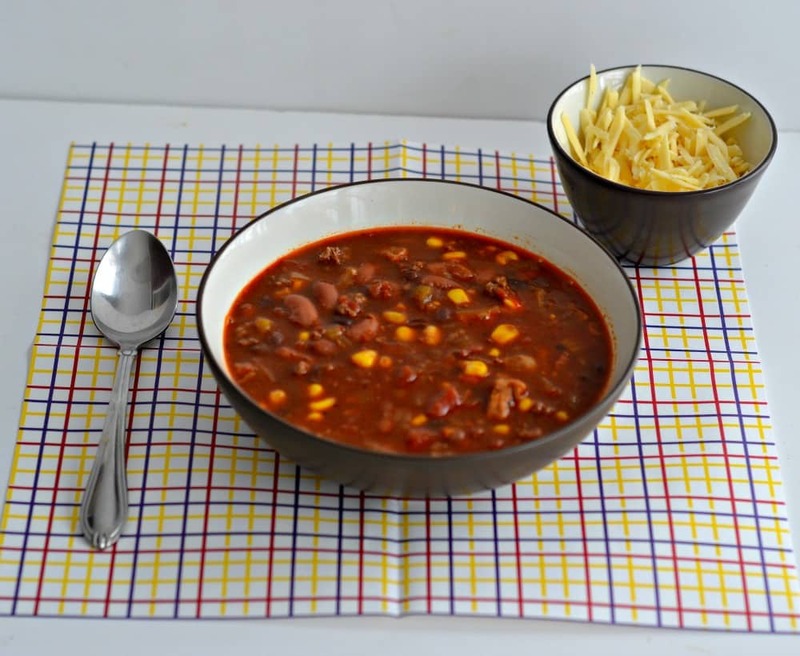 I included bacon, pork, and ground beef in this incredible chili recipe. I spiced it up with some green chilies and chili powder. Then I added in the vegetables; kidney beans, black beans, tomatoes, corn, and onions. The basis of this recipe was easy. The hard part came when I was trying to season it. I almost had my entire spice rack out next to the pot as I tried to decide which spices would work well together. I think I ended up with the right choices. I love how this chili looks and tastes. It’s actually a pretty chili with the colorful beans and corn in it. The flavors are spicy and complex. 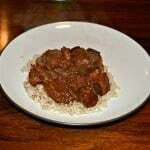 The hint of cocoa really adds an extra dimension to the chili. I think it’s one of the best recipes I’ve made to date! But, don’t take my word for it, go on and try it for yourself! You’ll be glad you did. Also, don’t forget to vote for you favorite chili recipe! I’d love it if you voted for mine, but I’ll understand if you vote for one of the other amazing chili recipes! In a large stockpot fry the bacon pieces over medium heat until the begin to brown. Add in the pork chop cubes and saute until they are no longer pink. Move the meat to the outer edges of the stockpot and add the onion, green chilies, jalapenos, and garlic to the center of the stockpot. Saute for 4-5 minutes or until they have softened. Add the kidney beans, black beans, corn, tomatoes, tomato sauce, beef broth, beerm and cocoa powder to the stockpot. Mix well and bring to a boil. Reduce heat, cover, and simmer for 1 hour. Taste the chili and adjust the salt and pepper as needed. Ladle into bowls and top with cheese, sour cream, and green onions. I really love corn and beer in chili! 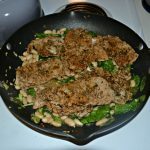 Your recipe looks delicious and I love that you topped it off with green onions! HUNGRY! Oh my goodness I love the idea of adding bacon to a chili, why have I not tried that before? This seriously looks perfect. I love the beer you added to the chili, I wish I did the same. Your chili looks just delicious!! I love it!! 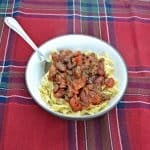 My family loves a meaty chili…and I’m wondering why I’ve never added bacon to mine before! So yummy! Bacon and chunks of pork = yes please!! Mighty tasty chili you have going here. Love the pork, bacon, beef combo and I always have to have corn in my chili too, looks so good!! Congrats on actually winning a chili cook-off!! I need to try your Chipotle Beef Chili!!! Awesome! Thank you! It was a fun, four state contest and I was excited to win! I love using bacon in chili too, it really adds flavor. Also, I’m totally agreeing with you on the coca powder. A little bit adds a real depth in the background, if used judiciously. Your chili looks terrific! 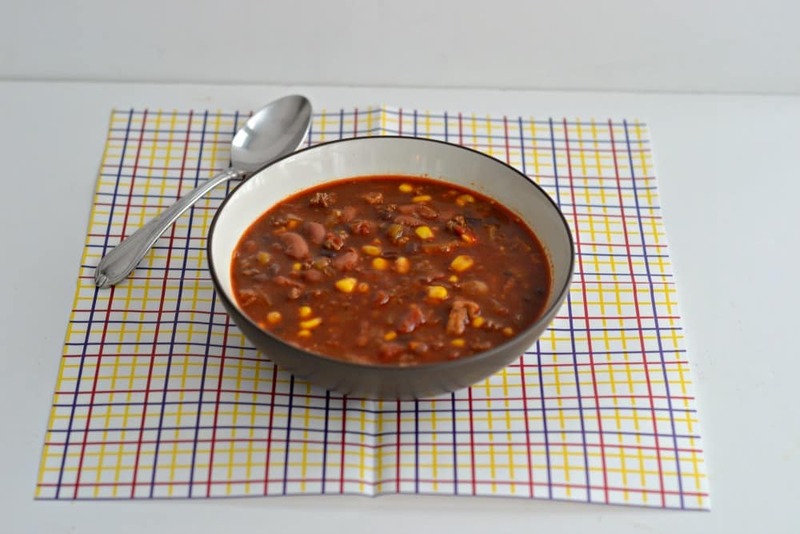 Corn, beer, and bacon – sounds like bachelor food, just what imagine chili started as! Great recipe! Bacon??? YESSS PLEASE! I would love to taste the delicious chili! Great recipe Heather! Yum!! This looks great!! I love all the flavors & seasoning you used. That looks so delicious! I think I will add chili to this week’s menu! I hope you enjoy it! We loved it here! What fun to add bacon and corn to a chili. Sounds delicious! What a great combo of meats – adding bacon sounds pretty darn smart to me! Chili is one of my favorite. 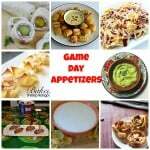 I love finding new recipes to try. Three great meats and golden kernels of corn to spice up the look — yes! What a gorgeous color you’ve got in your chili! Love the flavor combo! That looks really good. Perfect for this time of year. I know if one of those meats is bacon it HAS to be good. Great recipe! Three meats? That’s one intense chili! Looks so good! We are having a chili cook off at church this Friday! My husband has been making a pretty yummy chicken taco chili. Yum! Chicken taco chili sounds delicioous!